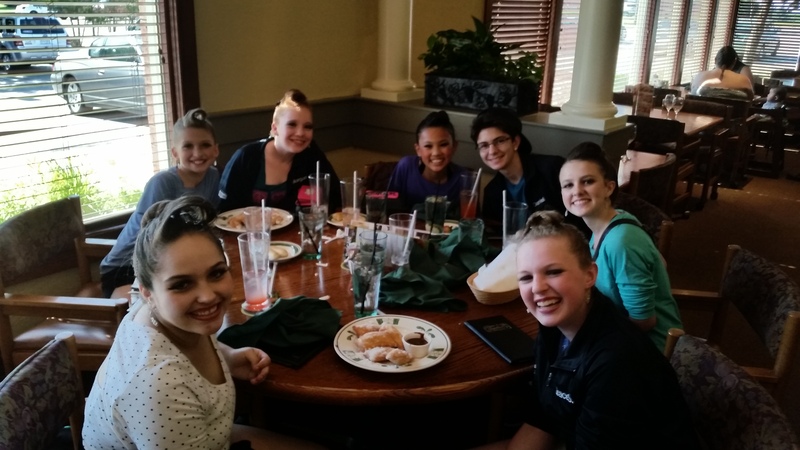 The last week of June, we were in Burnsville, MN for Masquerade‘s National Finals. The “week” started for Grace on Friday, June 19th with Master Classes. While disappointed there wasn’t a tap class, she really enjoyed all the classes. Her favorites were a Neo-classical ballet class, where she learned new things about ballet and terms. She also enjoyed both classes taught by a studio favorite – Sarah Jo Fazio. 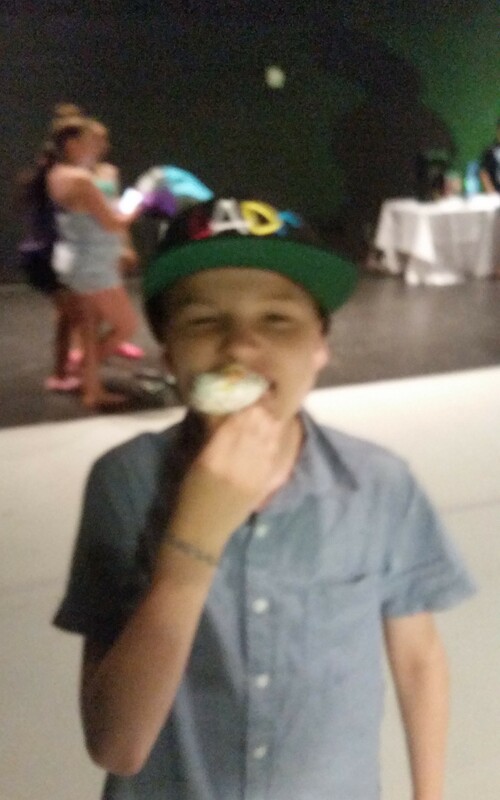 Michael, enjoying one of the cupcakes from the dessert table at the Welcome Party. There is something really fun about having a backdrop for pictures! This year, I was asked to teach summer school. Unfortunately for me, it started the same week as Nationals! I reluctantly accepted the position, knowing I would be missing several of Grace’s dances. She was a great sport about it, saying that as long as I could make sure she got there, and had her hair done, she would be fine. After all, she said, I had seen all her dances at the other competitions. 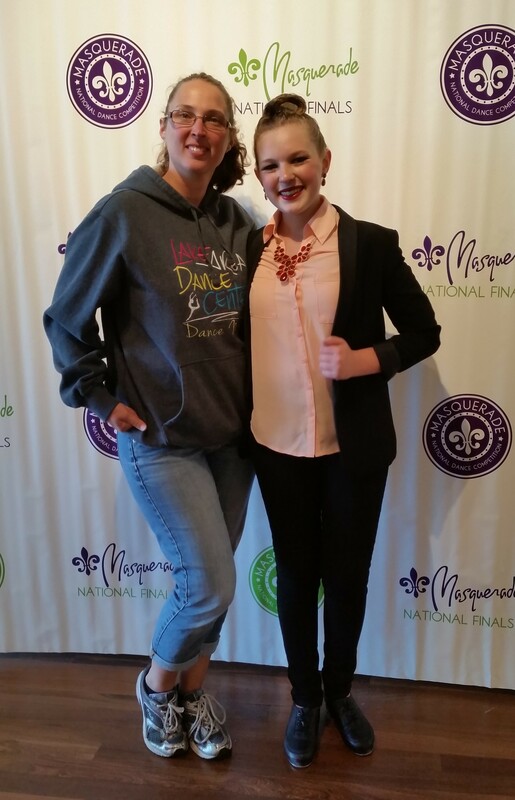 Another family who lives close by, offered to drive Grace on Monday and Tuesday mornings (they ended up bringing her to Finals on Wednesday as well, even though she wasn’t dancing). I got up early, did her hair, and dropped her off at the friend’s house. I missed her small group tap dance on Monday. I heard it went well, though, she said they had done better before… Tuesday morning, we had to get up even earlier, as I was doing the hair of the girl who’s mom was driving Grace. They got her there in plenty of time, and she danced her large group tap dance Tuesday. I went both days right after preschool was done, and was able to get there to watch all of the other dances my daughter was in. 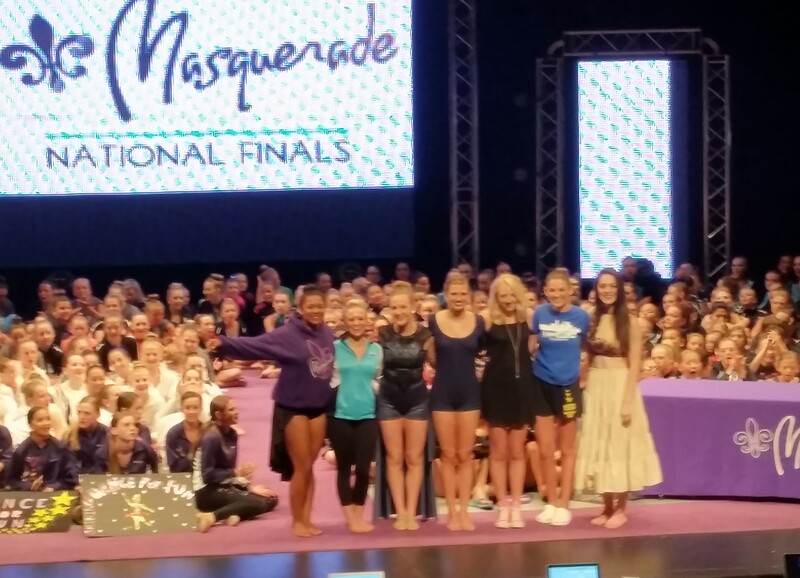 Sophie, 3rd from the right, was among the Seniors selected for a $1,000 scholarship from Masquerade! Congratulations! Tuesday was a really long day for dancers, as the schedule started with the youngest dancers, at the recreational levels for each style, and worked their way to the Purple (Elite) Seniors. Then, they moved on to the next style. The first dance of the day for our studio was at approx. 8:27 am, and awards were at 10:15 pm. There were some long breaks in between dances. Several LADC dances got nominated for Audience Choice awards. 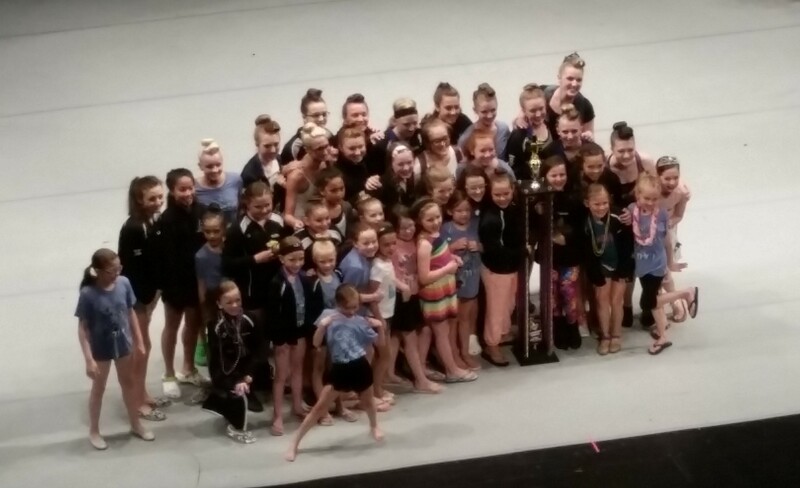 Many dances from our studio received platinum scores, and/or placed in the top 5 in their divisions. The Seniors, who had worked hard to make some changes to their dances in the weeks leading up to Nationals, had their best showing yet. their hard work paid of with those platinums in the purple division! YAY girls!! Wednesday was Finals, the most fun day of the week (for me, anyway). Finals are when we get to see the best of the best following an incredible Parade of Stars dance. Six of our dancers, plus several we know or recognize from other studios, were featured in this amazing dance mixed with magic! Several LADC dances were in the finals. Our Sparkles were in the Petite Encore performance category and won!! Other dances included Olivia Johnson as a Junior Division National Champion Dance Off contender; our seniors with their contemporary dance in the Senior Encore Performance division; Lauren Hinds representing in the Mini Division National Champion Dance Off; and small group, Bad, competing in the National Champion Intermediate Division Dance Off. Ending the night, Lake Area Dance was awarded 3rd place Top Intermediate Studio of the Year. The second major thing I missed, was Sarah Fazio giving out Judges Choice awards on large group day. She usually is very motivational, and has wonderful things to say about the dancers. Judge Joseph Creagh gave them out instead on that day. While he did a fine job, his awards tended to be more for individuals, and less about the groups. On large group day, I felt that it really should have been about those groups and their performances as a whole, not just about individuals who performed exceptionally well. They also seemed to go on forever, because he had a whole day to acknowledge. I often get questions about the timing of competitions… Nationals ran anywhere from on time, to an hour and a half ahead of schedule. Unfortunately, the mobile app, while still mostly awesome, it was not as good at correctly communicating how far ahead the competition was running. Nationals is always an exhausting, but fun week. The season is officially over, and summer dance is underway! Jenelle, first parent on the left, won the dance off for the moms! !